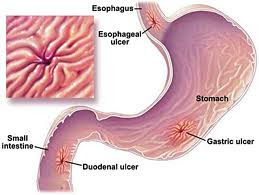 A patient 57 year old male had a surgical intervention to make Billroth II because he had a peptic ulcer for about 10 years. But recently he had abdominal pain and his diagnosis was a recurrent ulcer. Now what can we do to distinguish that this is secondary to the intervention or to a gastrinoma. What will be the best test to differentiate this situation? A 15-year-old boy was referred by his dentist for evaluation of recurrent episodes of maxillary and dental pain on the right side, accompanied by a purulent oral discharge. Physical examination revealed purulent material draining from a small opening in the gum next to the upper right maxillary first molar. A presumptive diagnosis of oroantral fistula was made, with probable extension to the maxillary sinus. Computed tomographic imaging revealed an ectopic tooth in the right maxillary sinus (Panel A, axial image, and Panel B, coronal image, with tooth indicated by black arrows). The ectopic tooth had obstructed the osteomeatal complex (Panels A and B, white arrows), causing the formation of a large mucocele (Panel A, red arrows) that resulted in the destruction of the bony floor of the maxillary sinus and the development of the oroantral fistula (Panel B, arrowhead). The presence of ectopic teeth in the maxillary sinus is most often asymptomatic but on rare occasions can be a cause of recurrent sinusitis. This patient’s ectopic tooth was extracted from the maxillary sinus by means of endoscopic surgery, and the patient has been symptom-free for more than 8 months. A patient 48-year-old male has hematuria and pain in his flank. Laboratory data: BUN, creatinine, and electrolytes are normal. Hemoglobin 18 g/dL and serum calcium is 11 mg/dL. The ultrasound shows a solid renal mass. d. Adrenal adenoma (Adenoma Adrenal). A 58-year-old male has had a cough for over 4 years with clear sputum. He has smoked one pack of cigarettes per day for 15 years and continues to do so. X-ray of the chest shows hyperinflation without infiltrates. The pH of blood is 7.37, PCO2 is 41 mmHg, and PO2 is 62 mmHg. (Un paciente varón de 58 años que ha tenido tos por más de 4 años con esputo claro, fumado una cajetilla de cigarros por día durante 15 años y continua haciendolo, en su radiografía de torax se observa hiperinsuflación sin infiltrados). El pH sanguíneo es de 7.37, PCO2 es 41 mmHg y PO2 es 62 mmHg. Buenas Noches… a mi hijo de 7 meses le salió como resultado en urocultivo pseudomona Aeruginosa 100.000 UC, no ha estado hospitalizado, pero yo trabajo en el área administrativa de un hospital sin embargo debo visitar diferentes áreas incluyendo hospitalización, etc. Puedo yo llevar esa bacteria a mi casa y transmitirla a mi familia? Espero Comentarios…. hola a todos, esta maldita bacteria es muy peligrosa porque a veces se desencadena el cancer. mi papa la sufre hace como 5 años, la combate pero vuelve y ahora tiene un carcinoma desencadenado por la bacteria o para otros medicos esta bacteria es un tipo de cancer 1. No se que hacer para ayudarlo, ya no podemos soportar este sufrimiento ya que esta recien operado de cancer prostatico y ahora otro cancer es lo peor!!! ayuda pliss den sus testimonios si alguien a tenido bacteria del pylori y cancer. Navegando en internet; en un momento de ocio en mi casa; encontré una serie de fotografías de ingestión de cuerpo extraños por diferentes pacientes, es increíble la cantidad y diferentes tipos de objetos que pueden ser ingeridos en forma accidental.calculate tax refund 2011estimate tax refund 2011 Aquí les presento las fotografías, realmente espectacularr…..
His progress chronicled by an X-ray, it took Jackson three separate attempts to remove from a nine-month-old boy four interlocked safety pins and a piece of wool the child had been fed by his sister. (From the Collection of the Mütter Museum, The College of Physicians of Philadelphia). Jackson removed an astounding variety of items, including a Perfect Attendance pin (from a four-year-old boy who, unlike most of Jackson’s patients, didn’t survive the removal) and a tiny Kewpie doll (from the larynx of a four-year-old girl, in less than two minutes). (Rosamond Purcell). In 1923, Jackson removed more than 30 objects from the infant Joseph B., whose parents suspected that a friend “deliberately fed these many articles to the child” (Chevalier Jackson Foreign Body Collection. Collection of the Mütter Museum, The College of Physicians of Philadelphia). Jackson taught children who had ingested lye to swallow a tube that might allow the esophagus, narrowed by scar tissue, to expand. (Modern Manuscripts Collection, History of Medicine Division, National Library of Medicine, Bethesda, Maryland). This “action exhibit,” on display at Philadelphia’s Franklin Institute in 1938, allowed museum goers to peer through a bronchoscope inserted in a breathing mannequin and use tools (all designed by Jackson) to remove a nail. (The Historical and Interpretive Collection of the Franklin Institute, Inc., Philadelphia, PA).